The data is available as a Premium subscription on Quandl.com website: Get API Access to Zacks data. Limited instant preview is available to all Wealth-Lab users. For the complete list of items in Zacks Fundamentals A and B collections (up to 200 items) check out the Fundamentals window in Wealth-Lab. The item value returns the Rating Mean Value. Each item comes with additional details attached: StrongBuys, Buys, Holds, Sells, StrongSells, and ConsensusTargetPrice_Mean. The item value returns the dollar dividend value. The item value returns the EPS Mean Estimate value. Each item comes with additional details attached: EPSMedianEst, EPSHighestEst, and EPSLowestEst. The item value returns the EPS Mean Estimate value. Each item comes with additional details attached: EPSActual, EPSSurpriseAmountDollar, and EPSSurpriseAmountPercent. The Zacks fundamental data is returned by Quandl.com for the usual tickers like "AAPL" or "IBM" whereas they use a very different convention when returning the static data e.g. "GOOG/NASDAQ_AAPL" or "GOOG/NYSE_IBM". 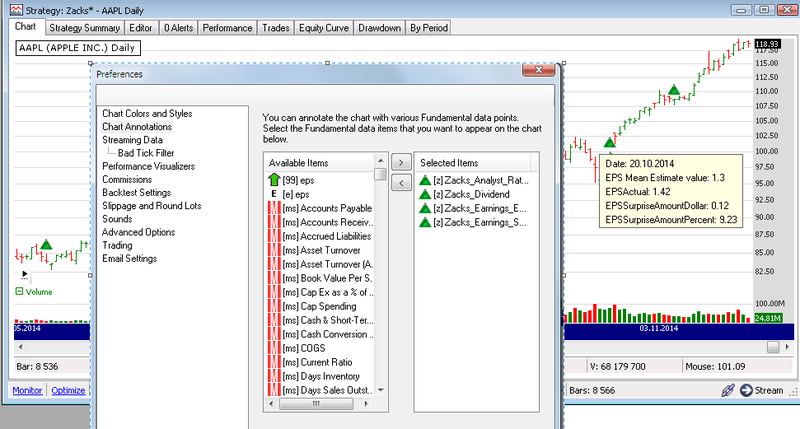 Because the symbols don't match, you can not chart Zacks fundamental items using Quandl static data. Fortunately, this is not an issue: firstly, they take the data off of Yahoo and Google for which there already are static data providers, and so you can simply use any other Wealth-Lab provider from the wide choice of available in the Extensions section.